iMyfone Umate is a popular and powerful space saver application from iMyfone Technology Co. that special developed to reclaim massive storage space for iOS device by securely freeing up storage, cleaning junk files, and perform photo compression on Windows or Mac PC. 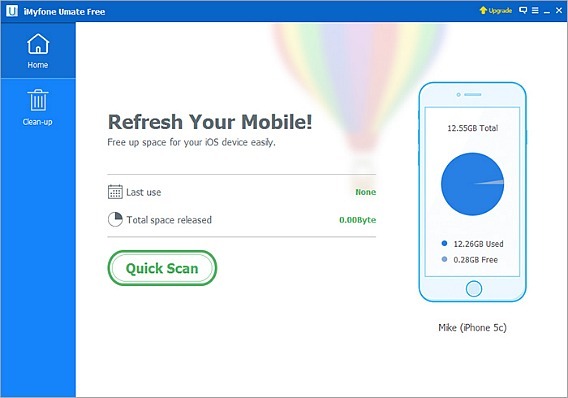 iMyfone Umate can perform scan on iOS device to find mass junk files created by third-party apps to identify files that are hogging storage space. Once completed, it will remove and delete unused files and apps according to iOS device user preference. Note: The data will be backed up first before clean-up, user don’t need to worry about important data deleted by mistake. The iMyfone Umate combines more than 25 analyzation techniques & technologies and eliminate over 30 kinds of junk files. More iOS space for more apps, music, photos and more fun! To use iMyfone Umate, first, connect iOS device to PC and enable the smart scan. The software will preview how much storage space can be freed up. Next with only one click, iOS user can clean junk files and freed up storage space in a short time. iMyfone Umate normally cost at $29.95 per license key. With celebrate Mother’s Day, iMyfone is giveaway iMyfone Umate (for Windows & Mac) for free at no cost. Interested user can grab by just need visit to iMyfone Giveaway Page and share the promotional to get free license. Giveaway valid till 9May2016. So, hurry up! Once shared and register, iMyfone will send an email to register email address with containing link and license code. Download the Mother’s Day special version by click the link provided. Note: If don’t receive the license code, please check Spam mailbox. The license code need to install & activate before the Giveaway offer over.